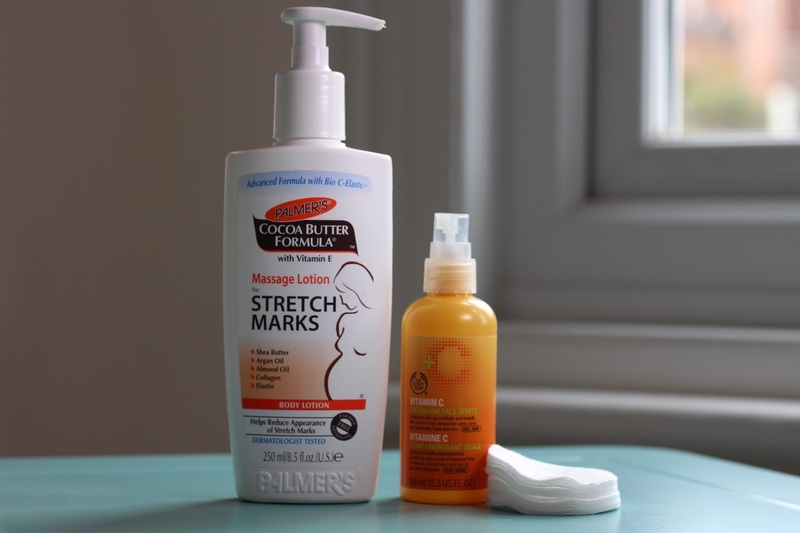 Today I wanted to share with you some products that have well and truly been my go-to items over the past few months when it comes to pregnancy. Centella Asiatica which is a natural leaf extract for revitalisation of collagen and elastin fibres. Argan oil, which if you didnt know, contains twice as much Vitamin E than olive oil and can help to soften and condition your skin. Each night before I go to bed I slather a good amount of the Palmers massage lotion over my growing tummy and tops of my legs. Its become a routine of mine now and it seems to be working as I don't have any stretch marks yet. The lotion has a strong sweet smell of cocoa but I don't find it overpowering at all. The formula is rich on application yet not greasy or sticky once you've covered your bump in it. I bought mine from Boots for £3.29. Next up is the Bodyshop Vitamin C Energising Face Mist. I spritz this on to a cottonwool pad and wipe away any last bits of makeup once I've finished washing my face. I suppose this isn't necessarily a pregnancy essential but its a nice addition to my all important bedtime routine these days. This spritz is going to be amazing in the warmer months when rather larger to just give my skin a boost of freshness when out and about. You can find this online or in-store for £11. 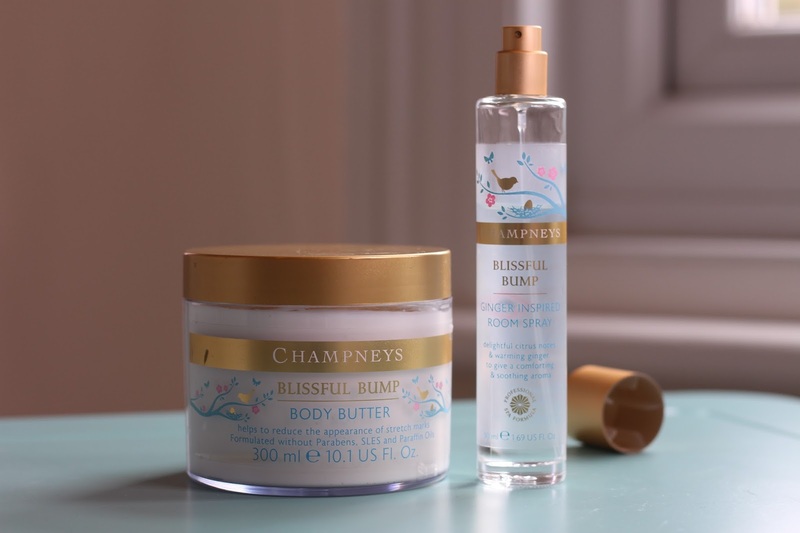 The next two products are ones I received from a lovely friend of mine; Champneys Blissful Bump Body Butter (£10) and Ginger Inspired Room Spray (£5). I've been using this thick luxurious body butter after showering and find it leaves my skin very smooth and soft. But, out of the two products, the room spray is my favourite; I keep this in our lounge at the moment but sometimes spray it in the bedroom before going to sleep. This spray is infused with the sweet scents of ginger, patchouli and vanilla; I find it really relaxing and the spritz adds a long lasting yummy fragrance to whichever room you decide to use it in. I'm usually not a fan of ginger but since being pregnant I've really started to enjoy food, drinks,candles and scents infused with ginger. If you didn't know, ginger is meant to ease morning sickness during early pregnancy too! The spritz is currently 50% off at the moment. Next up is my Dreamgennii Pregnancy Pillow- I got this pretty early on in my pregnancy as I wanted to get into the habit of sleeping on my left side as early as possible. However, its really become very handy in the last few weeks especially now that my bump is growing at a rapid rate! 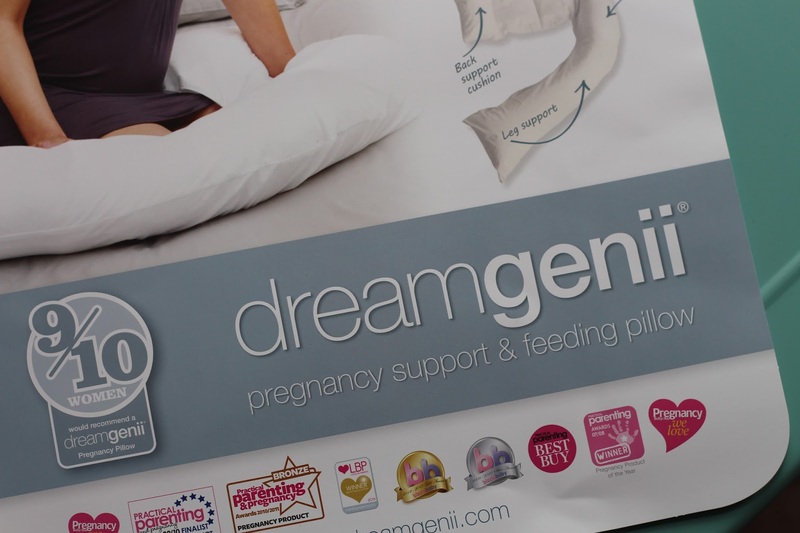 Sleeping on your left side when pregnant is recommended as it helps to maximise the blood flow between me and baby; the DreamGenii has helped me to stay in position whilst still being comfortable all through the night (apart from the 4am call to pee!). I have the smaller part of the pillow on my left side and the curved part either goes between my legs or just behind me to stop me rolling over during the night. The section in-between the pillow parts is just a thin sheet material that helps support my bump. It really depends on personal preference as to how you lie in this, I tend to have it quite far down my body at the moment but as I get bigger I might need to move it up. When I first got the pillow I did think it was on the large size but its actually not caused any spacing issues in our double bed thankfully! 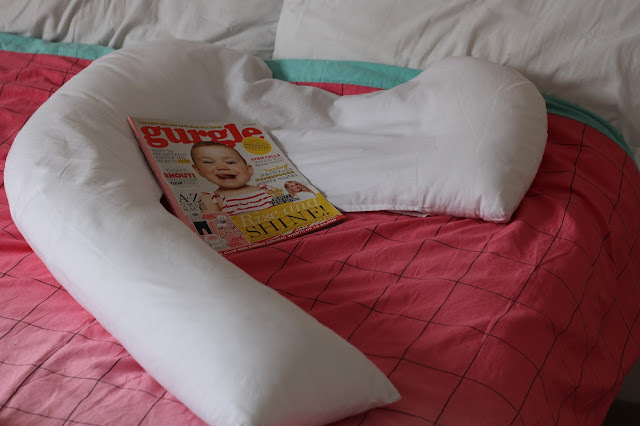 You can purchase the DreamGenii pillow and covers from their website; the basic pillow is £47.99 and as can also be used as a nursing pillow once the baby is here. Next up, undies. When I reached about 3 months I started to feel the need to don some more practical undies; nope, they aren't the most glam looking things but my god they are comfy. I think there is a bit of a myth in the world of pregnancy forums etc that you must wear non underwired bra's but I can't find any evidence as to say why... but comfort wise for me they are a must. 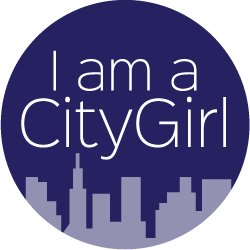 As my body changes my ribcage moves up and I get breathless more often so a wired bra restricting me is the last thing I want. When going into M&S to purchase a couple of bra's I'd planned on buying specific maternity ones but the helpful shop assistant told me not to bother yet and just buy comfy t-shirt bra's. The Non Wired Sumptuously Soft T-Shirt Bra fitted best and is reasonably priced at £20. I find these bra's so comfortable, supportive and they hold their shape really well after washing. I also picked up a few packs of the Low Rise Shorts (£7) in black; these are the most comfy knicks.. pick yourself some up next time you are in M&S, pregnant or not! Last but by no means least is Gurgle Magazine. 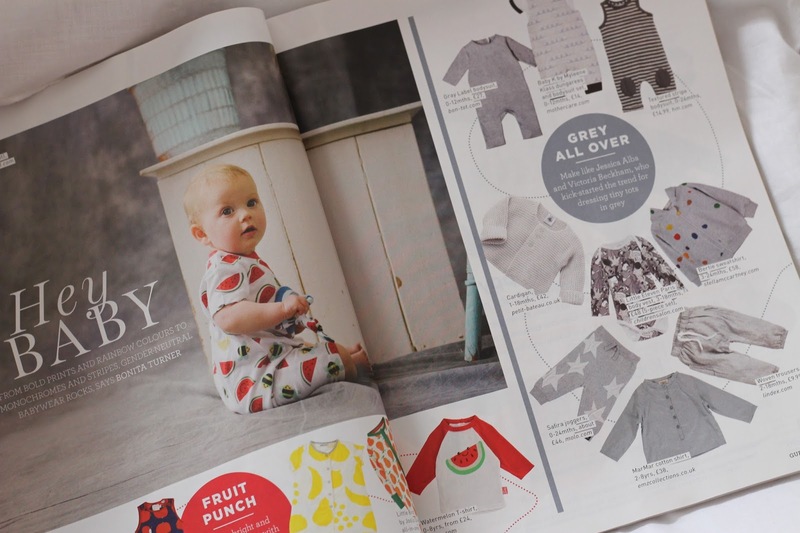 Gurgle is a glossy monthly mag for modern mums. 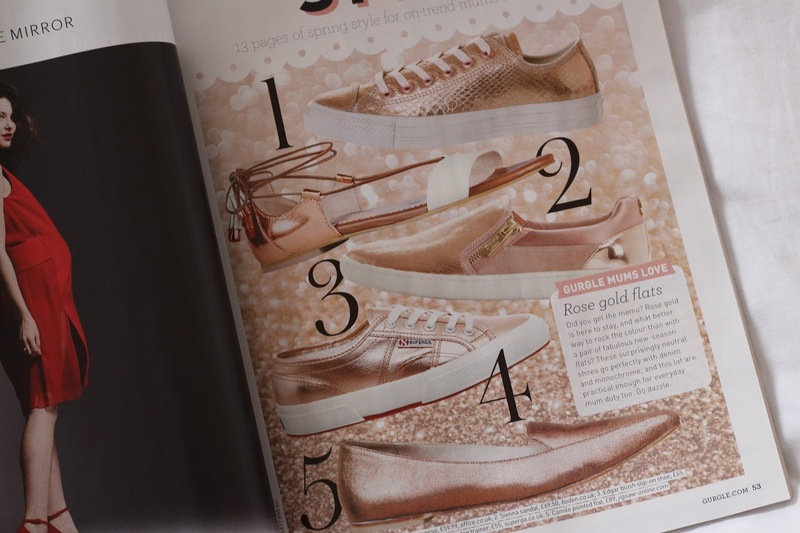 Gurgle covers such a range of topics from advice for parenting and family life, fashion for expectant mums, fashion beyond pregnancy, celeb news, beauty,food and nutrition. I've read this edition from cover to cover in about a week and love it- the clothing collages are adorable, from the 'Grey all over' section I especially love the Gray Label Bodysuit (£27 top left) from Bon-Tot and from the Fruit Punch section I love the Bee Friendly Romper Suit (£24 centre page on baby) from Lily and Sid. Our baby needs some of these cute rompers for sure! This Beau Loves romper from MillyMog is beaut. You must visit the site if you are looking for fashion forward baby outfits.. my fashionista Mr is going to love all of the items from MillyMog guaranteed! 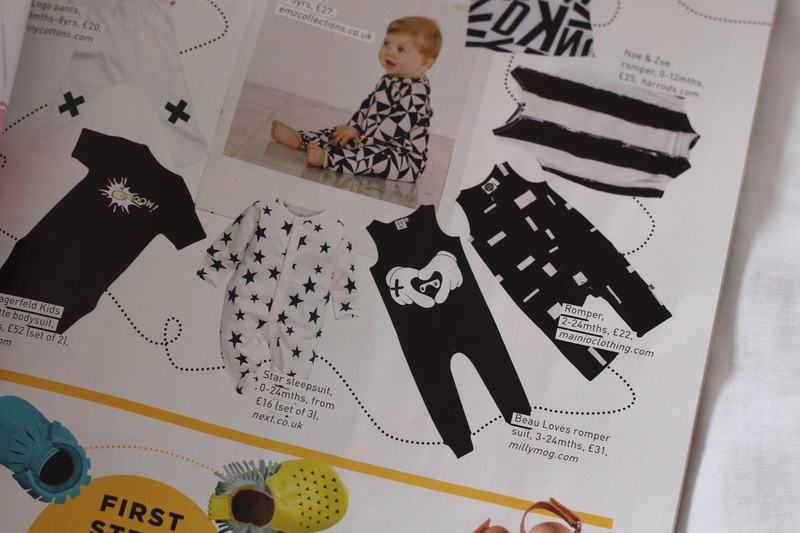 I also love the black romper with white blocks from Mainio Clothing... oh god.. looking through these websites makes me want to buy so much for the baba already! 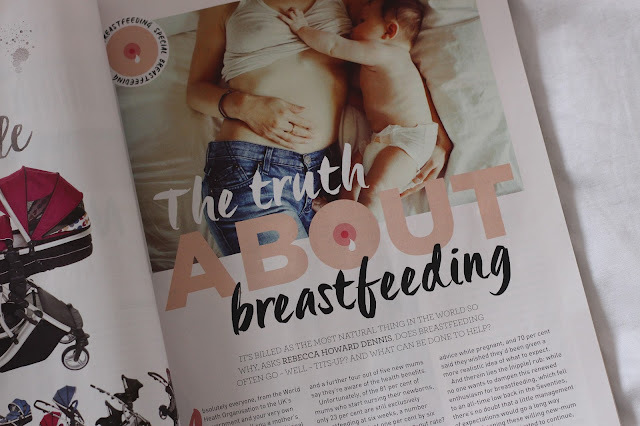 The truth about breastfeeding- this article discusses the somewhat skimmed over reality of how tough breastfeeding really is. It covers topics such as skin to skin, the first feed, the perfect latch, chest pains and tons more. This article has taught me so much! Heres a little round up of the article. Stem Cells- Should you be banking yours?- this article explores the pro's and con's of stem cell banking. Something i'd never heard of before but now feel a bit more clued up about.. although, i'm still unsure I'll have an extra £3k to pay for it! Heres a little round up of the article. Sweetest things- children birthday cakes of course! A moment of panic actually hit me when I saw this page in the magazine, it reminded me of all the amazing cakes my mum used to make for me as a kid and then quickly reminded me that I am utterly crap at baking. Its okay that i'll probably buy birthday cakes for our little one right?! OHH i must learn to bake! 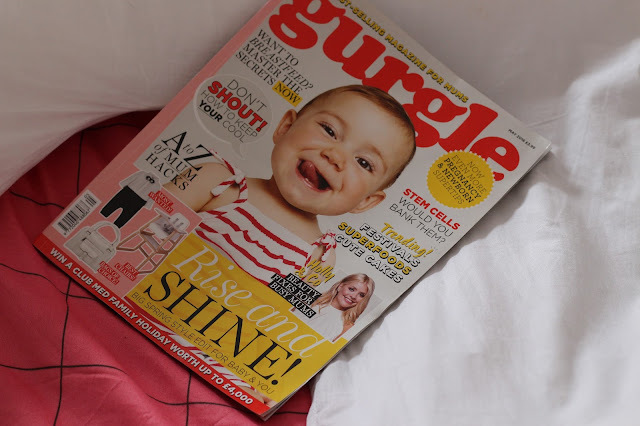 You can buy single editions of Gurgle from WHSMITHS and Mothercare for £3.99 per edition but the cheapest way to buy is via subscription; it works out at £1.50 each month.. pretty good saving! I hope you've enjoyed reading about my pregnancy essentials.. I'm sure over the next few months these will change/increase so i'll keep you updated. What were/are your pregnancy essentials? Im glad you have added pregnancy pillow. Lord knows when pregnant sleep is so important. For me, I had trouble with sleep starting in my first trimester. So, off to the internet I went. I found many solutions. If you feel uncomfortable in sleeping then use this type of pillow . This type Lowell of soft pillows bear your all weight. Make the most of your pregnancy considerably more with unadulterated basic oils to help you through every one of the feelings and changes that happen. Fundamental oils can be of incredible help amid this season of progress and supporting. I find http://toptenpillow.com this very good website for the best pillow. you can visit this site.